A horrific plane crash in Colombia left 71 people dead Monday night, including members of a professional Brazilian soccer team. But police said six people survived the crash in the mountains outside Medellin -- three soccer players, two crew members and a journalist. Four people who were scheduled to board the plane decided at the last minute to not travel, according to regional police. Authorities initially believed that 81 people were on board due to the passengers who did not fly. Two Chapecoense players did not travel with the team because of injuries, a club spokesperson told ABC News. The coach's son also did not travel with the team as planned because he forgot his passport. Two of the players who did not travel were photographed in the Chapecoense locker room following the crash. Flight attendant Ximena Suárez is stable condition, while flight technician Erwin Tumiri suffered non-life-threatening injuries, according to Colombian hospital Clinica Somer. Soccer player Alan Luciano Ruschel, of the team Chapecoense, is currently receiving care at the ICU, according to Clinica Somer, while goalie Jackson Ragnar Follmann is being attended to by trauma teams and specialists, according to Colombia hospital San Vicente Fundacion. The third surviving player, Helio Zampier, is in stable condition in the ICU after undergoing four different procedures, including a 3 1/2-hour surgery, said Guillermo Molina Mesa, director of La Clinica San Juan de Dios de La Ceja. Journalist Rafael Valmorbida is in stable condition in the ICU after undergoing surgery. He is on a ventilator, Mesa said. Goalie Marcos Danilo Padilha initially survived long enough to make a call to his father, but he later died, his relatives told ABC News. Aeronáutica Civil identified Padilha as a survivor in an earlier press release, but his name was not included among the survivors listed in a subsequent press release. A total of 71 bodies have been recovered from the scene, the Transportation Ministry confirmed to ABC News. 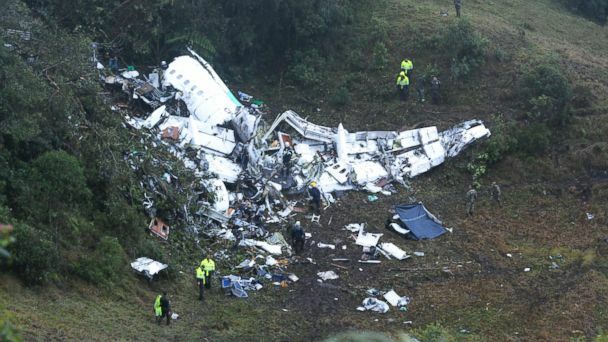 Most of the bodies were found in the fuselage and the rest were located in the area were the six survivors were found, according to Aeronáutica Civil, Colombia's civil aviation authority. The recovered remains are being transferred to an air force base. The tail of the plane clipped the top of a mountain, and the rest of the fuselage slid down onto the other side of the slope, an official with the Civil Defense of Medellin told ABC News. The pilot had declared an emergency prior to the crash, the official said. Both black boxes have been recovered and are in the hands of investigators, the Colombian Transportation Ministry confirmed to ABC News. A number of journalists died in the crash, including six employees of Fox Sports Brazil and three Globo employees, the companies said today. The plane, a charter flight operated by LaMia airline, was due to arrive in Medellin from Bolivia. According to the Jose Maria Cordova International Airport's official Twitter account, the plane suffered an electrical failure before the crash. The team was due to play against Medellin's Atletico Nacional in the finals of the Copa Sudamericana on Wednesday, local media reported. Aerocivil, Colombia's civil aviation authority, confirmed the accident and said the first steps of an official investigation have begun. The South American Football Confederation said in a statement it "greatly regrets" the crash and added that all of its activities will be suspended until further notice. Airport officials say the crash site can only be accessed by ground transportation because of the weather conditions. Even under good conditions, the landing into Medellin is challenging due to high terrain, poor visual cues and high altitude. There were scattered thunderstorms and showers at the time of the crash, said ABC News meteorologist Melissa Griffin. The Colombian soccer team that was slated to play Chapecoense for the final said today that it wants the Brazilian team to be crowned as champions of the 2016 South American cup. In a statement posted to Facebook, Atlético Nacional said the the South American Football Confederation should declare Chapecoense the winners of the cup. Michel Temer, the president of Brazil, declared three days of national mourning for the victims of the crash. Chapecoense surprised many with its tournament play this year, and ESPNFC declared its semifinal game as a David and Goliath match-up. Samantha Power, United States ambassador to the United Nations, called the team a "Cinderella dream" that ended "tragically." Neymar Jr., soccer star for Barcelona and Brazil, called the fatal crash "impossible to believe." Soccer star Lionel Messi offered his condolences on Facebook. Retired Brazilian soccer player Pelé wrote on Twitter that "Brazilian football is in mourning." ABC News' Joshua Hoyos, Matt Stone, Rachel Katz and Leo Mayorga contributed to this report.